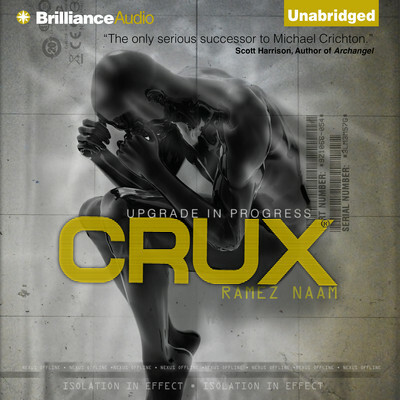 Crux - Audiobook | Listen Instantly! Finalist for the 2014 Prometheus Award. In the United States, the terrorists—or freedom fighters—of the Post-Human Liberation Front use Nexus to turn men and women into human time bombs aimed at the President and his allies. In Washington DC, a government scientist, secretly addicted to Nexus, uncovers more than he wants to know about the forces behind the assassinations, and finds himself in a maze with no way out. In Vietnam, Kade and Feng are on the run from bounty hunters seeking the price on Kade's head, from the CIA, and from forces that want to use the back door Kade has built into Nexus 5. Kade knows he must stop the terrorists misusing Nexus before they ignite a global war between human and posthuman. But to do so, he'll need to stay alive and ahead of his pursuers. Ramez Naam was born in Cairo, Egypt, and came to the US at the age of three. He’s a computer scientist who spent thirteen years at Microsoft, leading teams working on email, web browsing, search, and artificial intelligence. He holds almost twenty patents in those areas. He is the winner of the 2005 H.G. Wells Award for his non-fiction book More Than Human: Embracing the Promise of Biological Enhancement. He has worked as a life guard, has climbed mountains, backpacked through remote corners of China, and ridden his bicycle down hundreds of miles of the Vietnam coast. He lives in Seattle, where he now writes full time. Mikael Naramore narrates, directs, and has engineered hundreds of audiobooks since 2001. He has also produced critically acclaimed independent rock albums, run a small record label, launched dot-coms, owned and operated recording studios and—best of all—fathered two boys. He and his family live in the Pacific Northwest.